Wausau Area Birders and Bird Watchers Facebook, The best place to see what fellow bird enthusiasts are seeing in and around the Wausau area and north central Wisconsin. Raptor Education Group Inc, Antigo, Wisconsin – Dedicated to caring for injured or orphaned native bird species and public education on wildlife issues. George W Mead/McMillan Marsh Wildlife Area, Miladore, Wisconsin, A wildlife area containing over 33,000 acres of wetlands, forests and grasslands. Mead’s diverse habitats harbor an abundance of wildlife; 270 documented species of birds as well as a variety of North American mammals. 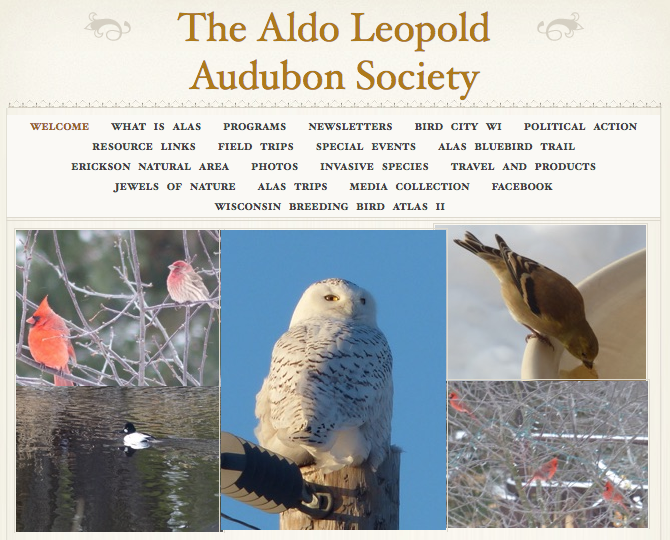 Aldo Leopold Audubon Society of Stevens Point, Wisconsin and their Facebook page. Badgerland Birding Badgerland Birding was created by brothers Ryan and Derek Sallmann, members of the Wisconsin Birding Community whose goal is to spread knowledge about birds and other animals that live not only in Wisconsin but all across the United States. Be sure to check out their YouTube videos which are very entertaining and informative. You may also what to visit the Badgerland Birding Facebook page, another fine resource. Great Wisconsin Birding & Nature Trail, The Great Wisconsin Birding and Nature Trail is a mapped auto trail that reaches into every area of the state. International Crane Foundation, Baraboo, Wisconsin – a non-profit conservation organization that works to conserve cranes and the ecosystems, watersheds, and flyways on which they depend. Wisconsin Bird Conservation Initiative, WBCI – A cooperative partnership to deliver a full spectrum of bird conservation emphasizing voluntary stewardship. Wisconsin Society of Ornithology, Promoting the enjoyment, study, and conservation of Wisconsin’s birds. Wisconsin Birding Hotspots – a guide to birdwatching hotspots in Wisconsin. Wisconsin’s Top 10 Birding Hotspots – This PDF offers up the ten best places to go birdwatching in Wisconsin. On the list of Wisconsin’s top 50 birding sites is our very own Wausau. American Bird Conservancy – with a mission to conserve native birds and their habitats across the Americas. The ABC website includes a wealth of information to protect birds with programs like Keep Your Cat Indoors and Window Collisions. National Audubon Society, To conserve and restore natural ecosystems, focusing on birds, other wildlife, and their habitats for the benefit of humanity and the earth’s biological diversity. Cornell Lab of Ornithology, Ithica, New York – We use science to understand the world, to find new ways to make conservation work, and to involve people who share our passion. All About Birds, A comprehensive guide to North American birds and bird watching from the Cornell Lab of Ornithology. Dendrocia USA – A great site to study bird photos and bird sounds. eBird, Global tools for birders, critical data for science. Birding in the 21st Century! The Nature Conservancy – Conserving lands and waters on which all life depends! Marathon County Birding Checklist This checklist of over 300 bird species was compiled by the Wausau Bird Club to enhance your Marathon County birding experience. Feel free to print this checklist for use in the field. It works best if printed on legal size paper – 8 1/2 x 14 inches. Please report any rare or accidental birds to the Wausau Bird Club at www.wausaubirdclub@gmail.com.